Two brothers need all their wilderness skills to survive when they set off into the woods of Wyoming in search of their absent father. Jake and Taylor Wilder have been taking care of themselves for a long time. Their father abandoned the family years ago, and their mother is too busy working and running interference between the boys and her boyfriend, Bull, to spend a lot of time with them. Thirteen-year-old Jake spends most of his time reading. He pores over his father’s journal, which is full of wilderness facts and survival tips. Eleven-year-old Taylor likes to be outside playing with their dog, Cody, or joking around with the other kids in the neighborhood. And the next day, they come home from school to find their mother unconscious in an ambulance. 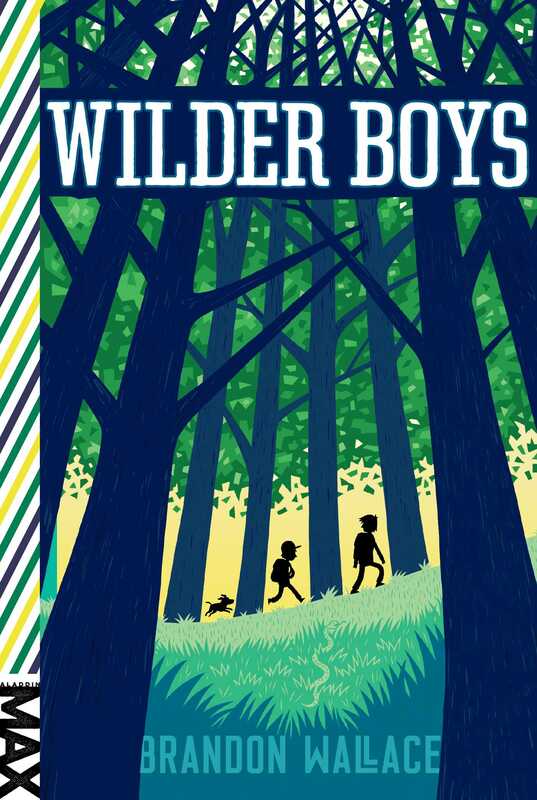 Afraid that their mom is dead and fearing for their own safety, the Wilder Boys head off in search of their father. They only have his old letters and journal to help them, but they bravely venture onward. 1 Splashing through murky pools of rainwater by the side of the road, the mud-splattered school bus rumbled to a stop. With an eager leap, Jake and his younger brother, Taylor, rose from their seats. Taylor ran his fingers through his wavy light brown hair and rolled his eyes up at Jake. At thirteen, Jake was only two years older than his brother, but that didn’t stop him acting like he was a know-it-all adult sometimes. However, before Taylor could answer, the boys heard a sharp high-pitched bark and saw a brown-and-white flash streaking toward them. The dog squirmed happily in Taylor’s grasp and plastered slobber across his cheek. Jake laughed. “He’s right on time!” Cody danced around the boys’ feet as if they’d been away for years, rather than a few hours. He always seemed to know the exact time they’d return from school. As they did every day, the two brothers and Cody turned down a side street into their neighborhood, strolling home to check on their mom. Taylor happily splashed through puddles in the broken sidewalk and kicked a rock toward a peeling yellow fire hydrant that had been almost completely swallowed by weeds. Jake kept quiet. The truth was, thinking about summer made his stomach feel like it was filled with gravel. Even though his school wasn’t exactly a five-star academy, Jake loved going there every day. He often spent lunch period in the library, devouring books. He hung out mostly in the action-adventure section, but he would read almost anything else in the library too. School was the one place he didn’t have to worry about Mom or her psychotic boyfriend, Bull. Jake halted and followed Taylor’s pointed finger, sweeping his dark hair away from his eyes. A brilliant yellow-and-black bird perched on a telephone wire less than thirty feet from where they stood. As the boys approached the neighborhood church, they spotted a black-and-white police cruiser parked on the street. Jake recognized the large, familiar shape of Officer Grasso. Jake just nodded. Both he and his brother liked the policeman. Once or twice a week, Officer Grasso would park here, a toothpick in his mouth, to greet the kids coming home from school. The neighborhood had a reputation for petty crime and drug use, and the policeman knew it made people feel safer to see him around. “What are you going to do with all your free time?” Officer Grasso asked. The officer had asked the question casually, but Jake picked up an undercurrent beneath his words. Jake had to be careful with these kinds of situations. The fact was, he was afraid of Bull, but he couldn’t let anyone know anything was wrong—least of all the cops. Although he would have liked nothing better than to see his mom’s boyfriend thrown in jail, Jake knew that if he took a wrong step, Bull would come after him. Even worse, he might go after Taylor or their mom. Or did it himself, Jake thought. Jake felt dread in the pit of his stomach. He hated lying to Officer Grasso, but he couldn’t take any chances where Bull was concerned. He had to keep his family safe. Jake and Taylor had lived in this neighborhood for the last seven years, ever since their father left. It wasn’t exactly mansion heights, but it was still a tight community. Gossip spread quickly. About four blocks deep by ten blocks long, the neighborhood was lined by simple clapboard houses that had seen better days. For Jake and Taylor, it wasn’t much, but it was home. A couple of houses down the boys passed the peach-colored house belonging to Mrs. Sanchez. As usual at this time of year, Mrs. Sanchez busied herself in the front yard, tending her small vegetable garden. “Hi, Mrs. Sanchez,” Jake greeted her. Mrs. Sanchez pointed to a half dozen fat twin leaves that had just poked up out of the ground. “Cool! What are they?” Taylor asked. Jake knew that wasn’t exactly the truth, but he didn’t see any point in contradicting his younger brother. At the end of the block, the boys approached their own place—a small house about twice as big as Mrs. Sanchez’s. Unfortunately, it was twice as shabby, too—at least since their mom had gotten sick. White paint peeled like dead skin from the wooden siding, while the wooden slats of the fence had begun to fall off one by one. Every year, Bull promised to get the place fixed up and painted, but like most of Bull’s promises, this one never amounted to anything. Maybe I’ll just do it myself this summer, Jake thought as he pulled open the screen door and entered the house. The boys let their book-filled packs plunk to the floor, and then they tiptoed back to check on their mom. The dusty, yellowed blinds were drawn in her room, but even in the dim light, Jake could make out his mother’s sleeping form and hear her ragged breath. A dozen orange vials of pills, half of them with their caps off, sat on the small table next to her bed. Their mom, Jennifer, had never told the boys exactly what was wrong with her, but Jake had overheard the words depression and anxiety. It had started four years earlier, about the time Bull had shown up. Since then she’d grown steadily worse. First she’d had to quit her job at the bank. Then she stopped being able to go out. For the last year she’d spent most of her time in bed. For the millionth time, Jake wondered how different it might have been if their father, Abe Wilder, had stuck around. And for the millionth time, anger boiled up inside him. If their father hadn’t been so selfish, Bull wouldn’t be in their lives. Most of all, their mother might not be sick. Usually, the fridge held nothing but Bull’s beer and maybe a half-empty ketchup bottle. Today a fresh pack of hot dogs sat on the middle shelf. “Looks like Bull used mom’s food stamps to buy some real food for once,” Jake said. Taylor grabbed the package and tore it open. He shoved one of the cold hot dogs into his mouth and gave another one to Cody. Just then the boys heard the front screen door open, followed by heavy footsteps. A moment later the scraggly, unshaved face of their mother’s boyfriend appeared in the kitchen door. Jake’s stomach dropped as Bull’s gray eyes flashed toward him. Bull kicked at Cody, but the dog deftly leaped to the side, cowering from the stocky, barrel-chested brute standing over him. “Taylor . . .,” Jake began, trying to calm his brother. Jake knew that once Taylor got going, there wasn’t much that could stop him. Even though fights with Bull only ever ended one way. “You’d better watch your mouth,” Bull snarled, stepping forward. Bull raised his hand to strike Taylor, his sinewy forearm slick with sweat. “No!” Jake shouted, leaping in front of Bull’s arm as it began to swing. The blow caught Jake flush on the cheek, knocking him to the floor. Cody began barking furiously. Jake saw purple spots but struggled to get back up, afraid Bull would strike Taylor next. However, instead of continuing the attack, Bull just glared at the two boys. Bull didn’t finish the sentence. Instead he spun around and stormed out of the house, tearing off the screen door as he left.